Aerial view of Pier Park design as seen from the East. Note the extensive green space incorporated into the design. Once again, some are debating our Pier raising the question, “Do we still need a new pier?” Reasons for a new pier are many. For example, there are economic arguments. In 2001, the Klages Group did an economic study of the Pier and determined an economic impact for the city of $42 million annually ($56 million in today’s dollars). 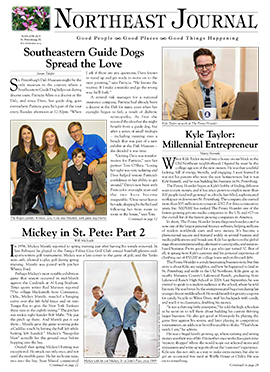 However the focus of this article is on how the new pier harmonizes with our Downtown Waterfront Parks and bay – two defining features of St. Petersburg’s sense of place. The New Pier design was originally called Pier Park. Due to another party having copyrighted that name, the City no longer refers to it as Pier Park, but simply as the New St. Pete Pier. Yet Pier Park was a great description for the design, and we will use that name here as our focus is on how the New Pier mirrors the Waterfront Parks. The New Pier design is a seamless extension and complement to our storied Downtown Waterfront Park System and common space. Compared with the previous pier, Pier Park will have an irregular contour rather than a straight solid cement line. And it will be covered over much of its area with grass, native trees and plantings. Also, a guiding principle for Pier Park is focusing on function first, and form second. The planning process has recognized that the most important thing is to design a new pier that will be used. View from the Pier Head restaurant, looking out on the Great Lawn and toward the cityscape. For those not living in our downtown condos, the Pier Park restaurant and Observation Deck provide a unique opportunity to enjoy the city skyline. Notable park-related features include a greatly expanded Spa Beach, including removal of the seawalls and changing the beach to a more natural state. There is also much added green space: Lawn Bowl at the pier head which can accommodate 3,000 people for events, and Tilted Lawn overlooking the large Welcome Plaza near Spa Beach; a canopied boardwalk (misnamed the Coastal Thicket); other Florida native landscaping; a new family-oriented park area and picnic grove; and a place to launch kayaks. St. Petersburg prides itself on its marine research institutions, and groups such as the Ocean Team were consulted regarding how the new pier could complement our city’s marine focus. The idea of some form of a marine discovery center received much attention. Consequently, Pier Park includes ‘wet and dry classrooms’ for marine education, and a new breakwater for water-calming protection of Spa Beach from erosion and nurturing of sea grass. 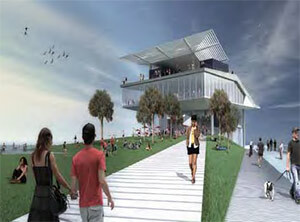 A Pier Education Advisory Team is planning use of the Education Building component. The Marine Discovery component of Pier Park includes an enclosed activity room and an open water area. Note the pilings saved from the original 1920s pier. These will help to attract a variety of marine life. Also note the open amphitheater. 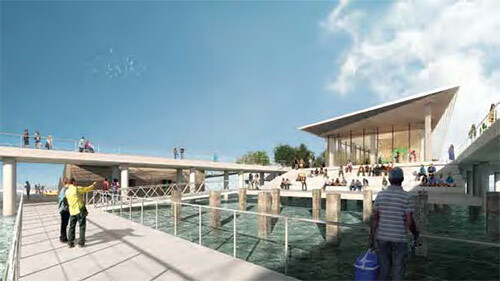 Activities or program features to be included in Pier Park include, first of all, fishing. There will be a large dedicated fishing deck and bait house at the end of the Pier. Fishing poles may also be rented. There will be dining; location for both large and small events; marine education; kayaking and boating including transient boat docks; trails for walking, jogging, and cycling; swimming at Spa Beach; kids’ splash pad and play area; and an open-air market area. Another outstanding feature is the observation deck at the end of the pier providing the public with great views of the cityscape. A covered tram will enable the public to get to all points of interest should they wish to use it. The fabric ribbons originally planned for the Pier Head building will be replaced with a more practical aluminum panel system. The restaurant in the Pier Head building will be rotated to the west to provide a 270-degree view, including the city panorama. The capacity of the Pier Head building has been increased (café: 1000 sq ft indoor/1,500 sq ft outdoor; restaurant: 7,600 sq ft; bar: 600 sq ft; total 10,700 sq ft). A second café will be located at the entrance to the Pier near Spa Beach. The Marine Classroom is designed to allow for future expansion. The Pier provides four natural marine habitats: the wet classroom which retains the 1920s pilings that will facilitate attraction of marine life; the breakwater reef; the sea-grass walk to the north breakwater; and the fishing deck over the 1970s fish-attracting caissons. The Fishing Deck will be lower and closer to the water (5 feet above) and extend over the previous Inverted Pyramid caissons. The observation deck and restaurant will be at the same height as these features were in the previous Inverted Pyramid. ‘Green Globes’ (similar to LEEDs certification) will be sought for the pier head building, and Envision (a rating system for sustainable-infrastructure features) for the remainder of the Pier site. Energy-efficient and environmentally friendly LED lighting will be used throughout the pier area. The Pier is designed for a 100-year storm event. The average height will be 11 ½ feet approximately 4 feet higher than the previous pier. Also, City staff will be recommending relocating the transportation stop, and replacing it with a large open-air park pavilion at the large Welcome Plaza near Spa Beach. The Plaza is viewed as a major gathering place. Transportation stops for the tram will be located just east of Bayshore, with another in the middle of the Approach along 2nd Avenue, and one at the Pier Head. Rendering of Great Lawn and Lawn Bowl, west of the Pier Head building. The Great Lawn and Lawn Bowl will accommodate up to 3,000 people for events. Additionally, three program features contemplated in the original proposal currently exceed the City’s $33 million construction budget. These are the north part of the breakwater, the boathouse and its associated floating docks, and a ‘water lounge’ at the Pier Head. The north breakwater and the boathouse/floating docks will be fully designed, engineered, and permitted in the event additional revenue can be found to fund it. The water lounge was eliminated for technical reasons. The design team also has developed a new unfunded proposal for enhancement of the splash pad, providing for night lighting, more robust water jets, and a civic fountain that was not part of the original design proposal. The City has submitted applications to date for three grants to assist with some of these needs. There is a companion planning process underway for the adjacent Pier Approach. Discussion of that is beyond the scope of this article, other than to say that the Approach is also being carefully designed including green-space enhancement as well as additional amenities. It is intended that the Approach fully complement Pier Park and the two sectors are viewed as a single whole. 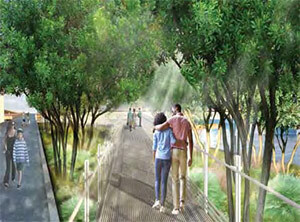 A boardwalk surrounded by beautiful native plantings and shade trees will line the north side of Pier Park. The pier planning process has been lengthy and thorough. The first Pier Advisory Task Force was appointed by Mayor Baker in March 2009. The Task Force was charged with development of alternatives for a new pier. This resulted in four massing alternatives for a new pier and two alternatives for the Pier Approach. Architectural style was not addressed. 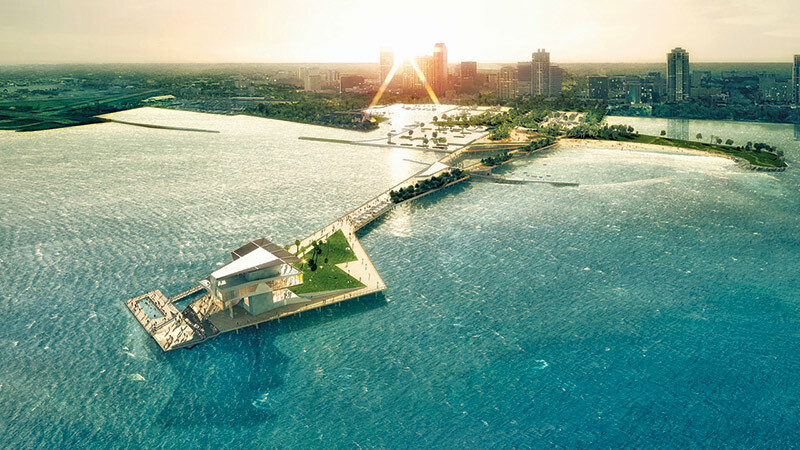 Rather than selecting one of the alternatives for the basis of the new pier design, the city chose to pass along all alternatives to the design firms competing for the project. The subsequent City planning process and international competition resulted in selection of a design known as The Lens. This was followed by the ‘8/28’ Pier Alliance Committee appointed by Mayor Foster. (‘8/28’ referenced the day after the referendum to be held on the Lens design.) The Alliance was charged with developing a consensus plan for ‘next steps’ – both should the Lens be approved, or should it be rejected. 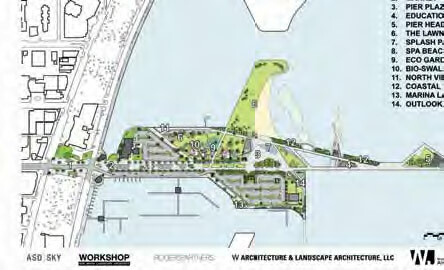 It was composed of all stakeholders in the pier issue, including those groups opposing the first design. The Pier Alliance was followed by a second task force appointed by Mayor Kriseman, simply called the Pier Working Group, which focused primarily on activities and programs to be offered at the new pier. 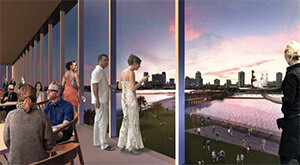 The process recommended by the Alliance was generally the process used which resulted in the Pier Park design. This recent schematic shows major features as currently planned for both Pier Park and the Pier Approach. Throughout the course of these planning activities, extensive efforts were made by the City to include citizen input, and other input was initiated by the public. The first Pier Task Force had four community visioning sessions, three task force forums, and conducted an online survey. In 2012, some 20,000 citizens signed a petition to save the Inverted Pyramid as a part of the new pier. Ultimately, it was determined that was not going to be possible given the uncertain condition of the caissons supporting it. In a subsequent referendum, the Lens design was rejected by 63% of those voting. After the first design was rejected, the City contracted with a professional polling firm which conducted a random telephone survey of 1,000 residents. Notably, 87% said they still wanted a pier. The second Pier Task Force held five public input sessions and conducted an online survey which had over 1,500 respondents. Since the beginning of the new pier planning process, some $12.7 million has been invested or committed on the project – including $3.16 million for demolition of the Inverted Pyramid Pier – and bonds have been issued to finance the remaining $37.3 million. Demolition of the Inverted Pyramid has recently been completed. Pier Park is now projected to commence construction in early 2017 and complete construction likely in early 2019. There has been much discussion of icons in the Pier planning process. 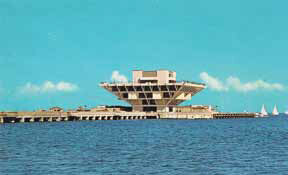 The previous Inverted Pyramid building at the head of the pier was certainly iconic, in effect the logo of the city seen on a multitude of media images over the years. Others have said that it is really our beautiful bay that is our city’s greatest icon, and interestingly the first failed design for a new pier, the Lens, presented itself as a lens through which to view and appreciate our bay. While the bay and marine environment is certainly a central part of our city’s sense of place, so too is our treasured Downtown Waterfront Parks. Some make a distinction between the Pier and our Parks. But they go hand-in-hand… especially this pier. Those of us who love the Parks also see great merit in Pier Park. For much of our history, Williams Park served as our Town Square. That was the special place where we gathered to play, to be entertained, and to stage events of all kinds. And while Williams Park, with its distinctive historic avant-garde bandstand, remains an important city amenity, it is no longer the Town Square. Our Waterfront Parks now effectively serve that purpose. Funding for both Pier Park and the Approach are investments in our Waterfront Parks, and they should be viewed as a whole. Can the Pier Park component be made better with a moderate additional investment? No doubt. But, most of the fundamental features of the original Pier Park design are being accomplished within the allotted budget. Alternatively, ceasing to fund Pier Park would be a great loss to further enhancement of the Parks. The Pier and adjacent Pier Approach is a major amenity for everyone. Downtown – especially the Waterfront Parks and Pier – is everybody’s neighborhood. The opportunity to make major improvements in this unique part of the Downtown Waterfront Park System rarely occurs. Pier Park is being built to last 75 years – nearly four generations. Now is the time to achieve the new quality Pier a great many have hoped for, and to further invest in our treasured Waterfront Parks. Will Michaels is the author of The Making of St. Petersburg and The Hidden History of St. Petersburg. He can be reached at wmichaels2222@gmail.com and 727-420-9195.